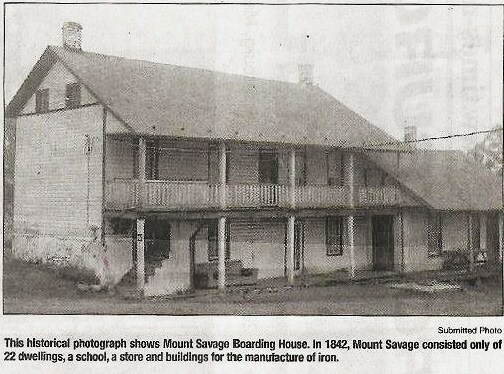 In 1842, the Maryland and New York Iron and Coal Company reported the construction of a village known as Mount Savage. It consists of twenty two dwellings, a school, a store, and buildings for the manufacture of iron. George Fair came from a long line of Marylanders who also agreed that Mount Savage was a beautiful place to live. My grandfather, Robert was born in Allegany Co., MD in 1796 and my father, Jacob was born here in 1821. My family lived between Mt. Savage and Glencoe, PA for many years. I married Ella Nora Hutzell on December 20, 1889. We settled in Mount Savage where I went to work as a coal miner. In 1900, after 11 years of marriage, we had seven children, the oldest, ten and the youngest, eight months. On September 20, 1900, I walked to worked, lunch bucket in hand, as I did every day. But this day was like no other. “George Fair, a driver, was instantly killed in the New York Company’s mine Wednesday. His car jumped the tracks and knocking out some supports, the roof fell on Fair, breaking his neck. His wife and seven small children are left. He lived in Mt. Savage.” wrote the Frostburg Mining Journal, September 22, 1900. As I write this article, I wonder what happened to Ella and her children after George died. There were only minimal pensions from he coal companies and no Social Security. What did Ella do to support seven children? How did she manage? What Happened to Ella Nora Hutzell Fair? Several weeks ago, Miner Recollections printed a story about George Fair of Mt. Savage who was killed in a mining accident, leaving a wife and seven children. At the end of that story I asked the question, "whatever happened to his wife, Ella Nora, and their children?" “Ella Nora and her seven children lived in a house on Calla Hill near Dutch Hollow in Mt. Savage. I believe the house may have been owned by her brother, John Hutzell. Ella Nora took in laundry and cleaned for others. She also cleaned for businesses, one of which was the Mt. Savage Bank. This was a time when children worked to help support families. ‘Chris’, the oldest boy, worked in the mines. Dulcie, the oldest girl, worked as a domestic for Dr. Price and his wife in Frostburg. The family had a garden and vegetables were canned and stored for winter. They had a cow and chickens. The younger children picked berries from the surrounding woods. At this time the citizens of the town looked after each other. When someone butchered a cow or hog, Ella Nora’s family was gifted some meat. Nancy goes on to tell about each of George and Ella Nora’s seven children. They each married, had good jobs and produced a total of 25 grand children. I admire Ella Nora’s courage and fortitude and think our generation could learn some lessons from her. The Coal Miner Memorial Statue Fund Is accepting contributions for the placement of an educational memorial near the crossroads of state Route 36 and the National Road in Frostburg. A bronze statue will honor all of our George’s Creek Valley miners, and name those who perished while mining. Tax-deductible donations can be mailed to the Foundation for Frostburg, CMMSF, P.O. Box 765, Frostburg, MD 21532. We thank Nancy for her updated information on the Fair family and encourage other participation.